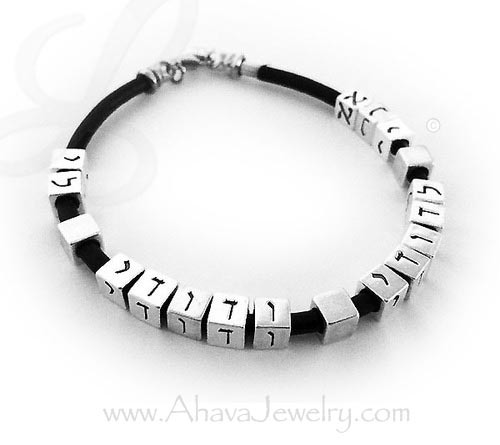 This leather & sterling silver 'any Hebrew name bracelet' is made with .925 sterling silver 5.5mm alphabet block letters spelling Ani Ledodi VeDodi Lee but you choose the name during the ordering process. The leather and sterling silver bracelet is $29. Each letter block is .925 sterling silver - $4/ea. Choose the number of letters, numbers or symbols during the ordering process below. You may have as many letters, numbers or special characters, as will fit, on this leather bracelet. The clasp on the bracelet is .925 sterling silver too. This bracelet can be for men or women, sons or daughters! “I am my beloved’s and my beloved is mine,” – Song of Songs (Shir HaShirim), Chapter 6, verse 3A. Shir HaShirim 6:3 - Many phrases from The Song of Songs written by King Solomon, have been used throughout weddings for centuries.